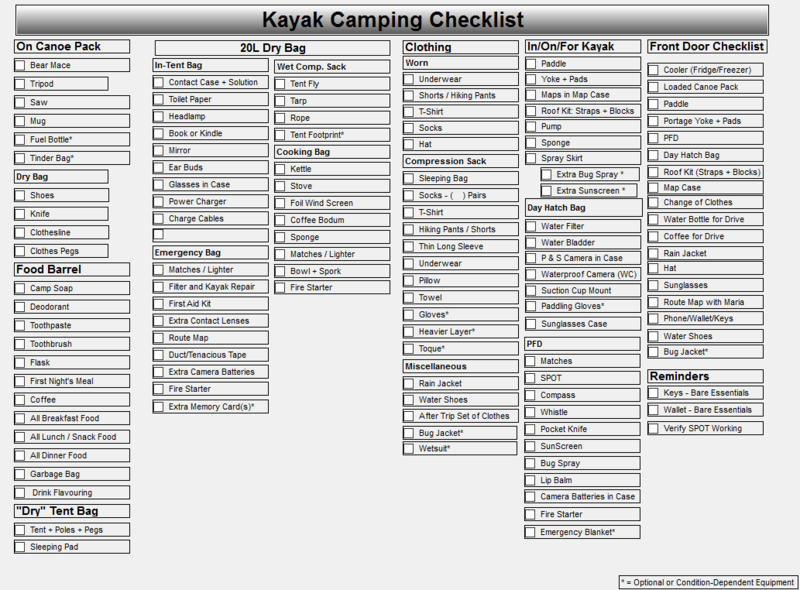 Before every camping trip I drag out my gear and sit down with my checklist. This checklist has gone through a dozen or more iterations over the years, but hasn't changed that dramatically. Often it's just re-arranging items as I change packing strategies, as everything is organized by the bag/barrel it's stored in. Updated May 2017. I've moved my saw to the outside of my pack, as there will likely be times on my next trip when I need it accessible. Early season + low maintenance portages means blowdowns, and I might need to cut a few branches to clear a way through. Digging into my tent bag to get at the saw doesn't sound like fun. I've added a mug as well (titanium, weighs virtually nothing) so I don't always have to drink directly from my water bag. Serious decadence I realize. I've moved the tripod out of the dry bag on the outside of the pack to being attached (via a carabiner) directly to the outside of the pack. The easier it is to get at the tripod, the more likely I'll be to use it while traveling (get-there-itis is a constant struggle for me). I've also sprinkled some fire starter throughout my gear (sealed packages of wetfire). It's safe to say at this point that my fuel stove is never rejoining me (except in a fire ban), so the wetfire is there to make sure I can always get a fire going, even in the worst conditions. I also added an inflatable pillow - a Sea to Summit Aeros Premium Deluxe. Before adding this I just took a pillow case and stuffed my clothes in it, but that was never all that comfortable. I think this inflatable pillow is going to have a huge impact on my sleep quality. Also I've now given up my SLR camera in favor of a top quality point 'n shoot. Partially because of the weight difference, partially because my SLR (Canon 60D) has terrible auto-focus on videos, which caused me to film the coolest moose encounter I've ever had somewhat out of focus on my last trip of 2016, which continues to annoy me every time I think about it. 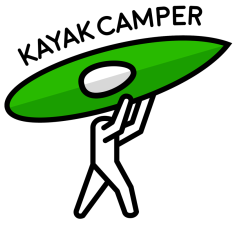 The SLR will likely still join me for shorter / less portage heavy trips strictly for picture taking, but my Spring 2017 opener is neither of those things (9 days, 35+ km of portaging). My clothing section is probably not needed. I'm not likely going to go out the door having forgotten to dress myself, after all. But as my complete set of camping clothing is separated between what's in the compression sack and what I put on when I head out the door, I prefer to have it all on the page to make sure I don't forget something. I also pack a complete set of clean clothes that stays in the car, waiting for my return. Putting on clean clothes after a trip feels fantastic. The Day Hatch Bag is just a mesh bag I put the gear in that will end up in the kayak's day hatch. The bag itself stays in the car. Reminders: Again, probably not necessary but I prefer to have the reminder. I take my keys and wallet with me into the back country - I don't like leaving valuables in the car - so I take off all keys I don't need on the trip, and take everything out of my wallet I can. When I discover a Costco in the interior I might kick myself for that decision, however. I always 'test fire' my SPOT before a trip to make sure it's working. Front Door Checklist: Mostly redundant, but it's my way of making sure everything I've packed actually makes it into the car. The rest of my checklist will have generally been completed a day or two before the trip, this section is checked off minutes before I head out, as I pile my gear up at the door before loading up the car. No, I don't take a cooler into the back country, but I do take burgers and a few cold drinks for the first night. The cooler keeps those things cold on the drive. Comments? Suggestions? I'm constantly tweaking how I pack my gear, and to a lesser extent the gear itself. I don't think I have all the answers. If you've got a suggestion for how I can improve the gear I take, how I pack, or just have questions, get in touch!